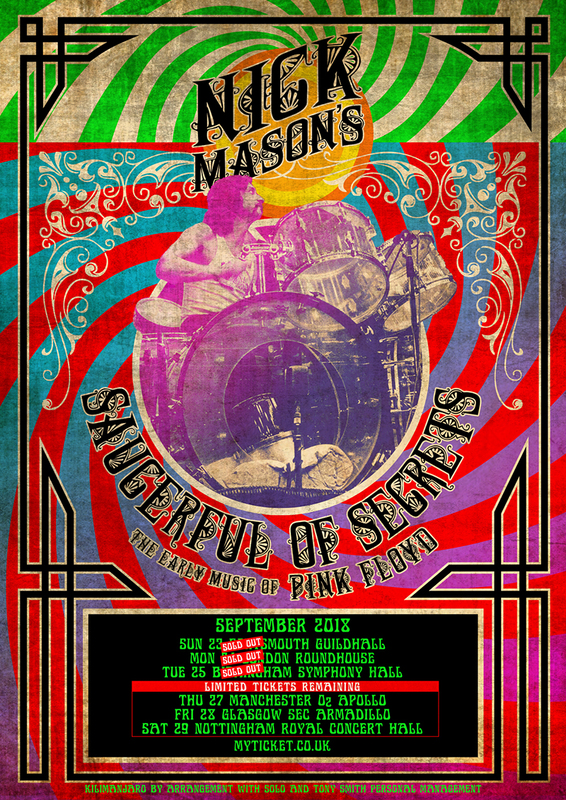 ….or, to be factually accurate: Nick Mason's Saucerful of Secrets. The former Pink Floyd drummer out and about with a quartet of seasoned musos of varying degrees of fame, performing pre-Dark Side of the Moon material. As might be expected, the live disc from the band's 1969 release Ummagumma was well represented, but there were also a number of surprise appearances. Lucifer Sam (written by Syd Barratt for his cat), Green is the Colour, Bike (complete with quacking/clacking coda) and, most jarringly, Vegetable Man. This last named was a half-finished reject from the Saucerful of Secrets album sessions, and whilst the song does admittedly possess a modicum of historical curiosity value, it would have been no great loss to 20th century culture had it remained on the studio cutting-room floor. Somewhat incongruously book-ended by verses from Roger Water's gentle acoustic piece If, we were presented with a generous wodge of Atom Heart Mother. I did wonder if the co-writer of the suite, Ron Geesin, whom I know resides not a million miles from Glasgow these days, may pop up during the performance – if even just to bellow “Silence in the Studio!”. But there was, disappointingly, no sign of the eccentric Scotsman. The most recent material performed was the opening two tracks from the 1972 album Obscured by Clouds, both of which worked rather well. I had hoped a few more gems may be dusted down from this underrated collection, but 'twas not to be. But we did all enjoy a fair old thrash-out with The Nile Song – possibly the closest PF ever got to heavy metal. The old Floyd tour-de-force One of These Days closed the main set, but Guy Pratt's thumb-slapping technique did not quite nail that driving bass riff, with the result the performance all came across as just a bit underwhelming. Nick Mason - ex Pink Floyd (but you probably already knew that). 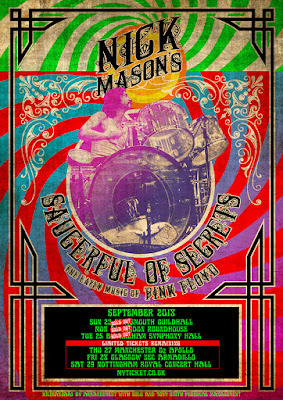 The first encore was A Saucerful of Secrets itself. Although each of the various sections were truncated to varying degrees; Mason perhaps feeling audiences these days no longer possess quite the attention span as in days of yore; for there are certainly some rather challenging avant-garde passages on the original recording. This evening's rendition was finished off with a fine guitar flourish by Gary Kemp, which sounded probably as close as any anyone could get to sounding like David Gilmour playing Comfortably Numb, without actually being David Gilmour playing Comfortably Numb. If you see what I mean. The second encore was an odd choice, I felt: the mediocre flop single Point Me at the Sky. Although I rather feel this one was chosen primarily to facilitate the show closing with the lines “all we've got to say to you is goodbye”. If I do have a significant grouch, it is that the vocal performances - delegated to Pratt and Kemp - were at best just adequate, particularly on the Barratt compositions. It is safe to say there are good reasons why Pratt is best known as a session bass-player, and why Gary Kemp was not the lead singer in his own band. But overall, this had been a fun evening, and I had hugely enjoyed hearing many tunes even the most dedicated Pink Floyd tribute band would probably never touch with the proverbial. Nick generally had nice things to say about Roger Waters, although did say his former bandmate was "not good at sharing". Mason apparently was never allowed to touch Rog's on-stage gong.